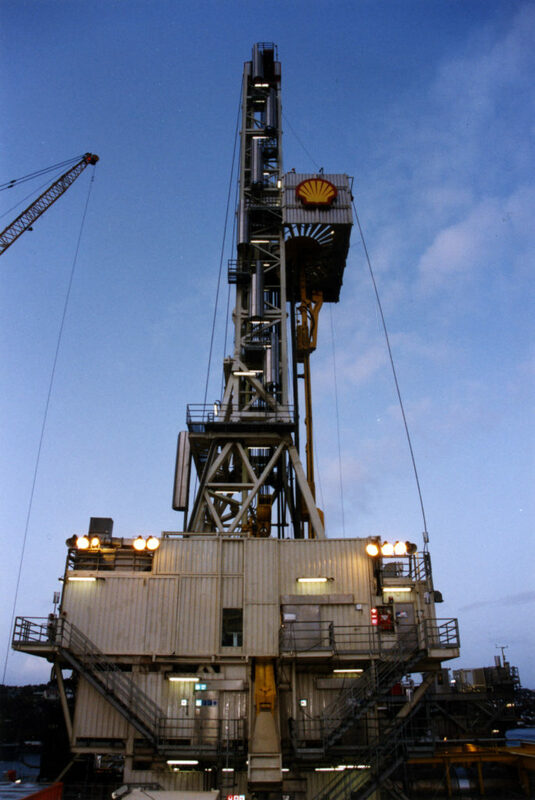 Transocean Drilling, which had taken over the Aker Drilling company, was commissioned to disassemble and remove the rig. Work began on 10 April and finished a month later. [REMOVE]Fotnote: Shell UP, no 5, June 1997. Apart from the mud pumps, the whole package was modularised – put together from separate, relatively small units – to simplify removal and reuse. This solution proved advantageous and meant that the whole job could be done with a limited number of people, using the platform’s own cranes to handle the modules. No heavy-lift vessel therefore had to be chartered, which made the removal decision much easier to take from a purely financial perspective. Nor was additional transport needed, since a recent shipping pool agreement (also covering large supply vessels) for the Halten Bank fields allowed components to be sent free as return cargo. unabated throughout the disassembly process. After removal, the drilling rig was held in intermediate storage at Vestbase in Kristiansund before being shipped on to Forus outside Stavanger. The package has been sold during the spring to the Stavanger-based Hitec company, which had delivered it originally in partnership with Canada’s Dreco. [REMOVE]Fotnote: Stavanger Aftenblad, 16 October 1997, “Hitec kjøper borerigg”. Hitec had intended to use the rig for a particular project which failed to materialise. Soon after 2000, however, an inquiry was received by RC Consultants in Sandnes south of Stavanger. Passed on by Hitec from the Norwegian agent of Russian state oil company Rosneft, this involved an invitation to tender for conversion of the Ispolin heavy-lift vessel to a drill ship. Rosneft therefore needed a rig for the project, which was aimed at drilling the first well in the Russian sector of the Caspian, and the Sandnes company won the job. This was accordingly a story of exporting Norwegian petroleum expertise, reusing offshore equipment from Norway and Russia’s commitment to increasing its oil production at the time. RC Consultants’ contract was originally worth NOK 120 million, including the drilling module and engineering services related to its testing, transporting, installing and commissioning. [REMOVE]Fotnote: Stavanger Aftenblad, 4 February 2003, “Russisk borerigg gir kontrakt til Sandnes”. “This rig only drilled five wells on Draugen from 1993, so I regard it as almost brand new,” Egil Tjelta, CEO of RC Consultants, told local daily Stavanger Aftenblad. Trial assembly and testing of the package took place at Offshore Marine in Sandnes during the spring of 2003 under the supervision of five Russian engineers. It was then broken down into two parts and transported to the port of Astrakhan on the Caspian in April. All this work was carried out with no problems of any kind. Different routes were taken by the rig sections, with one travelling by barge through the Straits of Gibraltar and via the Mediterranean, the Black Sea and canals. The other was carried by a specially adapted river boat via St Petersburg, the Russian canal system and the Volga, which empties into the Caspian. Installation on the ship occurred in Astrakhan, which is where the problems started. Nobody had told the Norwegian engineers that drilling would take place in very shallow water. The ship was actually due to sit in the seabed, because the Caspian in this area is only about five to 10 metres deep. Drawing on experience from Norwegian conditions and international safety standards, all warning lights flashed. Installing the derrick and equipment presented no difficulties, but the fact that operational safety was not approved meant that a drilling permit could not be obtained. The drill ship was admittedly renamed by President Vladimir Putin, but that carried no weight with the regulators. The project was shelved, but Ispolin was later used for other drilling jobs in the Caspian.